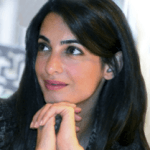 Amal Clloney is a Beirut-born lawyer who lives in London. She has worked with several high-profile clients including Julian Assange. She is married to George Clooney. The couple are introduced to each other at a charity event.